Most families have some dried pasta in the house, so here’s a few ways to use it to explore Bible stories together. While 1 type of pasta works fine, it’s fun to have a few different types. In this picture we used lasagne sheets, spaghetti and twirls (what are they called?). You could read the story from the Bible then provide the pasta and a board for everyone to have a go making a picture of the part of the story they liked most or think is most important or which spoke to them. You could make a series of pictures to tell the story. I’d usually pick 4 or 6 then take photos of them. You could use the pictures to create your own Bible story book by printing them out or making a photo book (currently I’m using FreePrints photo books which have 20 pages and cost £6 inc p&p). 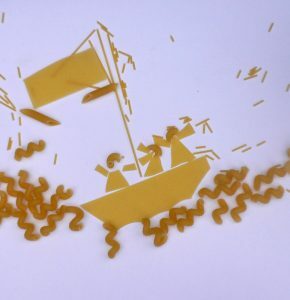 You could use the pasta to create pictures for a stop animation movie. You could use a phone or tablet to film someone using the pasta to show the story as someone else reads it from the Bible or resells it in their own words.